Marthe and David are in financial freefall and have to file for personal insolvency. Inevitably, they move to the outskirts of a forlorn village, into a house just barely habitable. The village – encircled by genetically modified cornfields bound for biogas plants – seems to have lost its soul; even the internet keeps its distance from the area. The few remaining inhabitants have forgotten how to live. When refugees are housed in barracks formerly intended for forced labourers, the settled order of the village is disturbed. Marthe, tolerated as an outsider and relentlessly looking for the worst possible news, notices how the village’s lethargy is gradually dissipating. David, however, becomes increasingly withdrawn, until one day there’s a note left on the kitchen table. 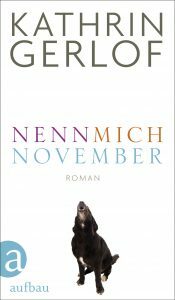 In an absorbing manner Gerlof delights her readers with her pure and poetic narrative about »scenes of fire and sore spots in Germany’s history« (Berliner Zeitung). born in 1962 in Köthen/Anhalt, lives and works as a journalist and author in Berlin publishing numerous press articles, TV documentaries and books. In 2008 she published her debut novel, Teuermann’s Silence and her second novel, All Time, was received with euphoric acclaim.